A stolen painting of Saint Luke the Evangelist signed “Rembrandt,” which previously belonged to the Giorgio Cini Foundation, has been recovered after 35 years, La Nuova de Venezia reports. The work dates from the 17th century and was stolen from the Castello Cini di Monselice on the night of December 12, 1979. It was recovered following a joint effort by Venice cultural heritage police and French authorities. 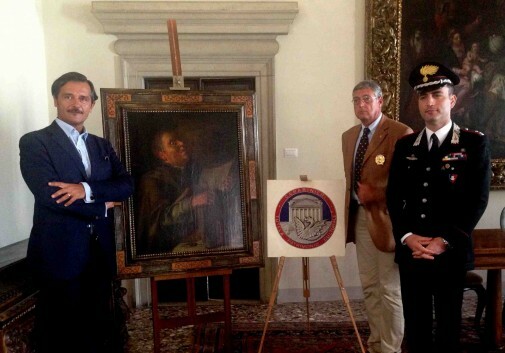 The painting was among 10 works stolen from the Castello Cini di Monselice on that night. At the time, the castle was owned by the Cini Foundation. In 1981, it became the property of the state of Veneto. The whereabouts of other paintings taken from its halls 35 years ago remains unclear. Over the subsequent five years, police were able to determine that the work was sold on the black market several times before reaching the possession of the consigning French collector. However, that wasn’t the most astounding fact. Though signed “Rembrandt,” the painting is actually by Pietro Bellotti, according to La Nuova. Experts examining the painting were immediately tipped off by its fairly strange depiction of St. Luke the Evangelist. They presume it may actually have been a portrait of its owner rather than the saint. According to the paper, the signature was most likely added in the 1990s during the painting’s time on the black market, presumably in order to increase its value. Experts estimate the painting is worth in the realm of €150,000 ($200,000) rather than the millions a Rembrandt of a similar size might fetch.